I'm super excited about this CAS note card. It literally came together in a matter of minutes. I placed the Patina stencil off the edge of a white card base and sponged over it with Picked Raspberry and Mustard Seed Distress Inks. I blended the two colors in the middle so it looks like I used three inks. Next I die cut my sentiment from the Hooray Creative die set and adhered it to the card base with liquid glue. My final step was adding a stamped sentiment below the die. Easy Peasy! This design is perfect for mass producing for gift sets. 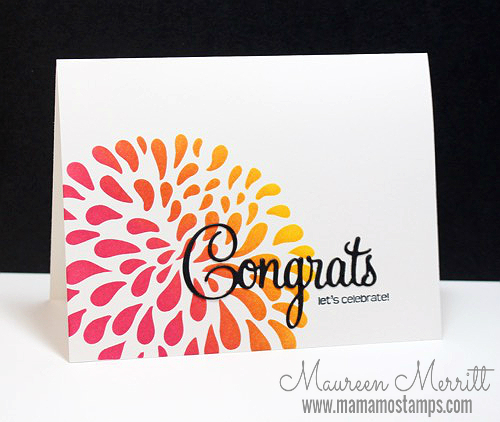 Change out the stencil and colors and make a simple note card for any occasion or season. Wow love this. I dont think I have this stencil but love the idea. So eye catching. Gorgeous card, Mo! Rock on!